As I write this, the book is “on press.” That means that the work of the past six years is being born right now. My understanding is that the actual printing takes the better part of a day — though there is lots to do after the physical printing and before shipping. It is hard to describe the sense of anticipation that I feel right now. 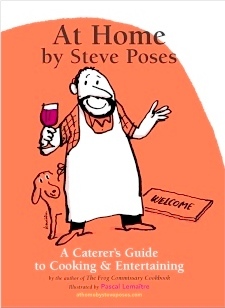 Each day between now and the ship date my post will feature from each chapter a recipe, a Pascal Lemaitre illustration and either a side note — a tip — or a “bottom note” — a little bit of autobiography. As we count eighteen days to the book’s ship date, I have eighteen chapters still to provide a taste. Chapter 2 continues Section 1 about Welcoming Guests. It’s extremely easy to make your own pita chips and well worth the effort. The homemade variety have a tempting crispy-soft texture that you just can’t get from a bag. Za’atar, a Middle Eastern spice blend of sumac, thyme and sesame seeds, can be found in specialty food stores and spice shops. These chips are excellent on their own; they can also be paired with charred eggplant dip (see page 79). do ahead Pita crisps can be made up to one day ahead and stored in a plastic freezer bag. 2 With a knife or your finger, poke a hole along the edge of pita rounds and peel apart, yielding 2 thin pita circles for each round. 3 Pour olive oil in a small bowl; using a brush, generously coat smooth side of pita. Generously sprinkle oiled side with za’atar and salt and transfer to cookie sheet. 4 Bake until lightly browned and crisp, about 6-8 minutes. Remove from oven and cool. For extra flavor, toast pita on grill pan or outdoor grill. Break pita into large, irregular pieces. A cornerstone of entertaining is intentionality. Anyone can serve pretzels or chips, but it takes the enterprising and organized entertainer to serve one of the multitude of snack mixes available in Indian groceries. These often spicy and colorful blends of seeds, fried noodles and crunchy beans are much more fun than potato chips. Or try setting out a bowl of Japanese wasabi-coated peas, found in the aisles of an Asian market. The Japanese also produce an array of sesame seed and seaweed wrapped rice crackers that are excellent with cocktails. Also, if you want to share the excitement of our daily countdown along with a daily recipe, illustration and note, pass this along to friends and family. P.S. Wednesday morning we begin operating the daytime food services at The Franklin Institute. We have long been the evening caterer there, but Wednesday marks a new daytime beginning for us and The Franklin Institute. It’s extremely easy to make your own pita chips and well worth the effort. The homemade variety have a tempting crispy-soft texture that you just can’t get from a bag. Za’atar, a Middle Eastern spice blend of sumac, thyme and sesame seeds, can be found in specialty food stores and spice shops. These chips are excellent on their own; they can also be paired with charred eggplant dip (see page 79 of At Home).